They hope to find an entrepreneur with an idea so powerful it will shape the recruitment industry for years to come. If you were tasked with finding the top professional in your industry who could bring forth an idea so powerful that it would start an entire movement and new global model for doing business in the future, how would you go about it? 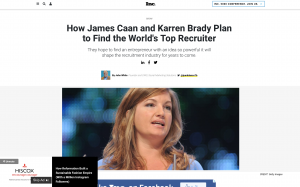 Well, if you’re James Caan (celebrity business investor, Hamilton Bradshaw Group) and Karren Brady (celebrity business executive, Baroness Brady of Knightsbridge) you join forces with the internet docu-series Top Recruiter. Then you go out and rent a massive castle in England and bring in 50 of the top global thought leaders in entrepreneurship to have them discuss business, people, and innovation over a period of five days. There will be two teams, North America vs. Europe, competing to find a single entrepreneur whose idea will re-engineer the business side of talent acquisition. What sets this show apart is the amount of counseling and coaching the entrepreneurs will get from top executives from around the world. Executives like Ann Swain, CE0, APSCo, Darren Ryemill, CEO, Opus Professional Services Group, Matt Sauri, CEO, Wimmer Solutions, and Bert Miller, CEO, Protis Global will be directing the entrepreneurs as they develop ideas that will solve an industry problem, then helping make and refine their pitch and face scrutiny from the celebrity business executive panel. Entrepreneurs on other shows face heavy scrutiny from celebrity judges, but they don’t get a lot of mentorship or coaching on how to advance their ideas. Top Recruiter is focused on communication and mentorship. It’s much more than just a group of entrepreneurs making a pitch. When it comes to entrepreneurs in the recruiting industry, there is almost nobody more influential than the seventh-most-followed Influencer on LinkedIn, James Caan, who boasts investments in more than 20 recruiting firms. Each entrepreneur will have just 90 seconds to pitch their business idea for their respective regions (North America and Europe). Each region has a chairperson, chief executives, advisors, and global counselors. After each entrepreneur gives their pitch, there will be a Q&A from leadership. Only one entrepreneur from each team will be selected to move forward. The entrepreneurs who were not selected will stay with their team to help support the entrepreneur whose idea was chosen. Each entrepreneur will now have the opportunity to refine their business concepts and work with their team and mentors. This round is all about the leaders preparing the entrepreneurs and their team for the final round. The final two entrepreneurs from North America and Europe will compete in London (at the painted hall). They will face the executive panel (celebrity business minds Karren Brady and James Caan). Only one entrepreneur will have their idea will be accepted, and that person will be the winner. Which team will produce the winning entrepreneur? With the best of Silicon Valley, it seems that team North America has emerged as the early favorite. However, the European team brings a lot of talent to the table, so the Americans better be prepared to bring their A game. Each team believes it can win. You can catch the show on themovementseries.tv or via Youtube.